Commercial Air Conditioning Sydney, As a specialized team we can design a suitable solution for your business. Since 2006 we have installed in many factories, offices, restaurants and bars, shopping malls, units, churches which has provided us with the know-how to design a solution for you and your business that is both efficient and energy friendly. We can organize a meeting with you to see the plans or go onsite. That way we can check your needs and together find a air conditioning solution that is adequate for your type of business. In the past, for example, we had to install over 20 Air Conditioners for one client, together along with the client, we found a solution that was both environment friendly and that gave great aesthetic pleasure. In factories that we have installed we needed a very powerful air conditioner so that you don’t feel the heat from the heavy machinery but also quiet so that it allows the workers to feel comfortable and safe in their working area. So that for every business you have an air conditioner that suits your needs, Commercial Air Conditioning Sydney. 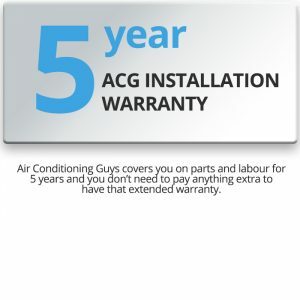 Air Conditioning Guys covers you on parts and labour for 5 years and you don’t need to pay anything extra to have that extended warranty. Enquire now for a FREE no obligation quote.